The TALL Group of Companies, the UK leader in the provision of secure paper and electronic payment solutions, is honoured to have secured the UK’s highest official accolade for business success. Her Majesty The Queen has approved the Prime Minister’s recommendation that the organisation should receive a Queen’s Award for Enterprise in the International Trade category this year. 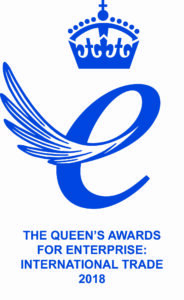 The Queen’s Awards for Enterprise are the most prestigious awards for UK businesses and are globally recognised. Now in their 53rd year, the awards have a long history of recognising exceptional UK businesses. The Queen’s Award to Industry, the scheme’s original title, was instituted by Royal Warrant in 1965, with the first Awards announced in 1966. It later became known as the Queen’s Awards for Export and Technology in 1975, before becoming the Queen’s Awards for Enterprise in 1999. Each entry is judged by a specialist panel that makes a recommendation to the Prime Minister’s Advisory Committee. Her Majesty the Queen then decides the winners, who each receive an official grant of appointment and an invitation to a reception at Buckingham Palace. This is the second time that The TALL Group has been accorded the Queen’s Award after Hinckley-based Checkprint Limited received the Queen’s Award for Enterprise in Innovation in 2005 for its cheque printing software applications. Now operating internationally, The TALL Group successfully exports to over 20 countries, with products ranging from cheques to vouchers and from certificates to ballot papers for elections around the world. The growth of this international trade has established The TALL Group as a market leader for highly secure and top-quality print products and services. This has encouraged organisations around the world to rely on the organisation’s committed workforce in the UK to provide a wide range of secure documents. Indeed, The TALL Group achieved record sales over the judged period for the award, boosted by an order for 25 million ballot papers for elections in Uganda. Martin Ruda, Group Managing Director, said: “We are thrilled to have won this prestigious award for the second time. This new award recognises companies that have demonstrated significant commercial success through the development of international business for products or services supplied from the UK. “The TALL Group’s core business is built on printing special cheques and credits and whilst the use of the cheque is changing we have thrived due to our ability to position ourselves in new markets, making use of new technology and developing our business internationally. “As a Group, we have been able to utilise the collective experience of our teams, based in our three sites, to grow our export sales activity avoiding reliance on one product stream. By being innovative we have not just survived in this business but have also been incredibly successful. Hinckley-based Checkprint have reached the finals of the Leicester Mercury Business Awards for the second year. 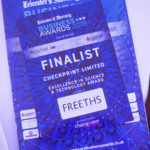 Winners of the Customer Service Award in 2017, Checkprint were nominated in the Excellence in Science & Technology category of the awards that took place in Leicester on the 12th April 2018. Up against strong competition from other local entrepreneurs, Checkprint came away with a Finalist trophy on this occasion. All the finalists were praised by the organisers for their use of the latest technology in developing products and systems within their respective operations. Checkprint has seen major investment in new IT infrastructure to enable it achieve the Cyber Essentials Plus accreditation. In addition, ongoing in-house product development of cheque fraud prevention software tools has seeen the Hinckley business create new sales opportunities both within traditional and new market sectors.